Gardening on slopes: slopes can be dry and need irrigation. Blog / Landscaping / Landscape Design / Gardening on Slopes: What about Irrigation? Gardening on Slopes: What about Irrigation? 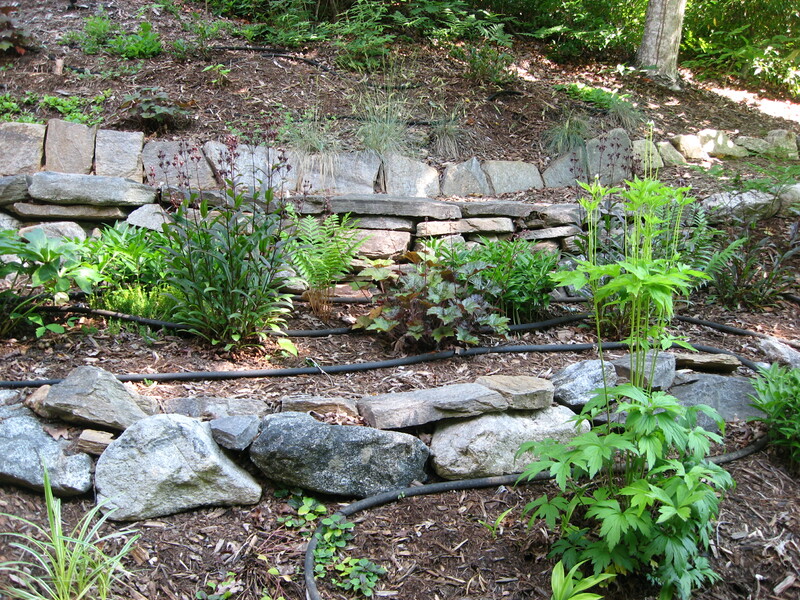 Because steep slopes tend to be dry, plants may need irrigation, at least until they are well established. 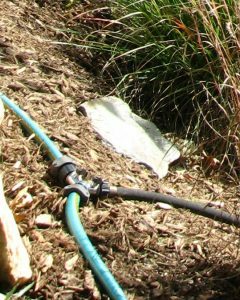 The most effective way to provide moisture on slopes is by drip irrigation, either with soaker hoses or perforated pipe. It’s easy for a gardener to install soaker hose, but you’ll probably want to hire a professional for an elaborate irrigation system with timed zones and buried pipe. If you choose to use soaker hoses, run regular garden hoses from your house hose bib to the top of your hill. Then connect your soaker hose to the garden hose at the high point. Snake the soaker hose back and forth across the slope, but keep it continuously moving downhill. Circle the soaker hose a couple of times around trees and large shrubs. For large areas, you may need several downhill soaker hose runs. Toggle switches can be used to switch the water flow from one hose to another. Use metal pins to secure the hose to the slope and then bury it under mulch. A good covering of mulch—such as ground hardwood or pine fines—will reduce your irrigation requirements by helping to retain soil moisture and keep plant roots cool. Soaker hose runs across and down slope. Toggle connector switches water flow among several soaker hoses. The general rule for watering gardens is to apply one inch of water per week. It may take up to 1½ hours of continuous irrigation to distribute an inch of water through a soaker hose system. On slopes, it’s best to cycle the water flow on and off every 20 to 30 minutes. Water for 20 minutes, then let the water soak into the slope for 20 minutes, then water again for 20 minutes until you’ve applied the needed amount of water. On and off cycling reduces runoff down the slope and encourages more water to soak deeply into the soil. Article written by Beth Leonard, Extension Master Gardener Volunteer.